ABC is easy as 123 with our ABC Rugs! Do you have a hard time getting your class to sit still for an alphabet lesson. Do your students fidget and squirm every time you write number son the chalkboard? We have designed an interactive way of getting your children involved in learning the alphabet and numbers. Our ABC Rugs contain upper and lower case letters in colorful individual rectangles that engage young children to recite the alphabet. Your students will have fun sounding out the seasons, numbers, shapes, and animals that appear on our colorful interactive rugs. After an alphabet lesson, your students can comfortably relax on our indoor air quality certified ABC Rugs. We treat the rugs with antimicrobial agents to prevent mold and mildew. The durable SoftFlex® consists of tightly woven fibers that protects your children from extremely hot or cold classroom floors. Our rugs remain wrinkle free and they withstand the most rambunctious young children. You can roll out this rug every day for years and continue to see the bright colors and creative images. 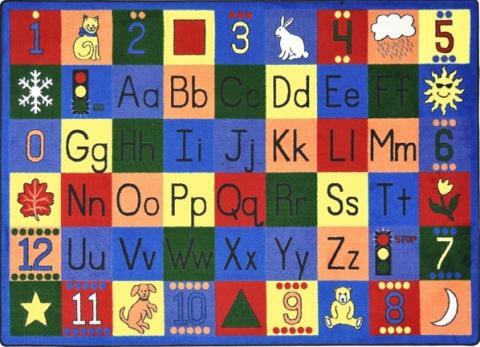 We make the ABC rugs in three sizes to match most classroom sizes.